The purpose of an EMC testing laboratory is to perform Electromagnetic compatibility (EMC) testing. To meet regulatory compliance requirements for regions or markets. Sometimes to meet commercial contracts. It also helps ensure correct operation for a product. When the product is in the same electromagnetic environment as different equipment. And helps ensure the avoidance of any interference effects. Testing requires specialist chambers and test equipment usually to perform the testing. Our facility is easy to access and close to the East Link and other public transport infrastructure and essential amenities. 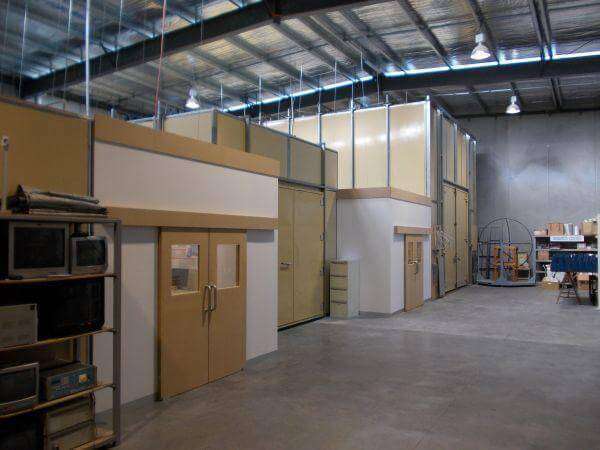 We have many dedicated EMC testing chambers in our large custom fitted facility. The facility was purpose-built to ensure ease of access to test chambers in the most efficient manner. It includes all the essential electrical fittings and outlets you would expect in a facility of this calibre. Each chamber has 32 Amp three phase, 15 Amp and 10 Amp general purpose outlets. To cater for your AC mains requirements we also have 120VAC, 60Hz source available. Used for FCC compliance testing. We also have DC power supplies and automotive batteries with a charging station. We have a range of test chambers of varying sizes and also capabilities. Ranging from our smallest chamber for transient immunity testing type work. Up to our 10-metre long indoor Open Area Test Site (iOATS) for radiated emissions testing. This chamber is FCC and IC registered. And is a compliant iOATS test site to the latest ANSI C63.4-2014 site validation requirements. The majority of testing for projects can be performed in parallel. Provided the test samples are available. 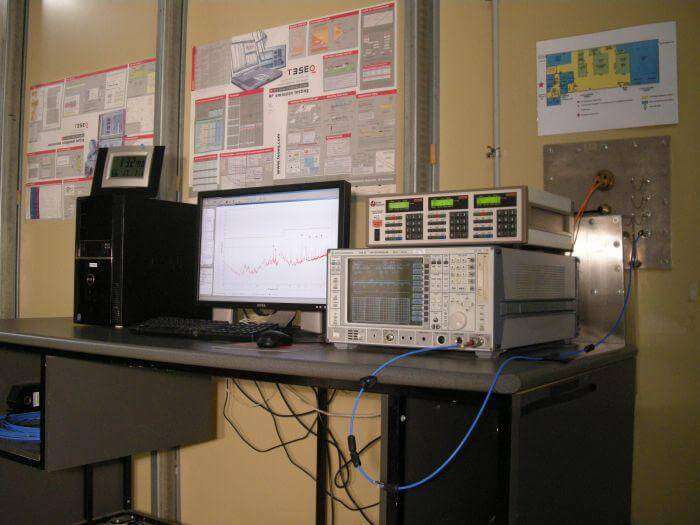 Dedicated EMC testing facilities result in the most time efficient testing process. All our chambers have been professionally installed and calibrated or verified as required. Customer amenities include off-street parking and internet access. A large mechanical and electrical laboratory work area. Which includes a vast array of on hand tools and essential components. Along with EMC and EMI fix samples from leading experts in the field of EMI mitigation solutions. Each laboratory work area is independently air-conditioned. All our staff are friendly, knowledgeable and willing to assist. Here to help your company in achieving your compliance requirements. Our indoor Open Area Test Site or commonly known as the iOATS. Was specifically designed and installed at our facility to cater for the demand of indoor testing of radiated emissions. Our Radiated Emissions test site provides a compliant valid testing environment. Which includes the test site been fully compliant with ANSI 63.4: 2009 and C63.4: 2014 required for FCC and ISED testing. Testing in a compliant iOATS facility has many advantages over performing emissions in a two-stage process. Which normally involves performing pre-scans in a non-compliant chamber or screened room. Then performing the final measurements out on an outside test site. These advantages include a real representation of the emissions over the frequency range. Due to the low reflection of RF on the chamber walls. Screened rooms or chambers without adequate RF absorbing material such as ferrite tiles and RAM (RF Absorber Material). Or physically unsuitable due to the dimensions of the chamber can create misleading results. These misleading results can be caused by constructive and destructive nodes. At varying frequencies depending upon the reflections and size of the chamber. And the relative position of the antenna. EUT and the conductive surfaces such as the chamber walls. This effect is typically worst at the lower end of the frequency range 30MHz to 300MHz. With no ambient emissions from outside influences such as TV, FM radio, transmitters. Whilst maintaining an equivalent open area test site characteristics. Measurements over the frequency range can be accomplished in less time. Although the hourly rate to use our iOATS facility is slightly more than using a non-compliant iOATS test site. In most instances, the total cost to perform the testing is cheaper as less time is required. Another advantage of using an iOATS test site where all the measurements can be performed in a single process. Is only having to set the Equipment Under Test (EUT) and the associated support equipment up once. This is also a significant time saving and obviously another significant cost saving. Not to mention the time delay caused by moving sites or having to drive, commute or send the product to a different location. Or possibly a different laboratory that could be interstate. Calibration of an OATS site is usually performed at a single position. Whilst the calibration of an iOATS site several positions are required. This defines the boundaries of the Normalised Site Attenuation (NSA) volume. This NSA volume defines the maximum dimensions that a product can be measured whilst ensuring the test site is still compliant. On an OATS site, the dimensions or volume of the product under test is not considered. Our iOATS is ANSI C63.4-2014 calibrated from 30MHz to 1GHz with a test volume diameter of 3m. Our iOATS is also calibrated for Site Voltage Standing-Wave Ratio (SVSWR). With the preferred dimensions over the entire required frequency range of 1GHz to 18GHz as per CISPR 16-1-4 (CISPR 16-1-4), Edition 3.1 (2010 + A1: 2012). One obvious advantage not mentioned so far is the actual climatic conditions during the testing process itself. Rain, snow, high humidity or extreme variations in the weather may affect the radiated emissions results. These variations can cause an increase or decrease in the measured values. And may make compliance uncertain for borderline compliant products. Thus the compliance status if the testing was to be repeated could be in jeopardy. Radiated Emissions re-testing does occur when there is an issue. Usually a dispute concerning the compliance or market surveillance. It can occur at any stage over the life cycle of the product. We recommend using a fully compliant suitable chamber for your product testing. If we cannot perform the testing in accordance with the standard you need we will upfront and clearly inform you of this. EMC Bayswater has a commitment to performing testing efficiently and correctly. Whilst providing great customer service. Accommodates most small to medium-sized products. As per CISPR 11, small equipment. Is either positioned on a tabletop or standing on the floor. Which, including its cables fit in a cylindrical test volume of 1,2 m in diameter and 1,5 m above the ground plane. CISPR 25: 2016 compliant Radiated emissions test site. Used for automotive ESA component EMC testing. Can accommodate large products. Such as Industrial Machines (conditional testing) with a length of 9.8m a width of 5.0m and a height of 4.0m. Automated Surge, EFT and Voltage dips and interruptions. Capable of performing a suite of tests in accordance with a product family such as EN 55024. All EMC and RF test facilities or the entire for EMC test facility hire can be arranged, on an hourly or a discounted daily basis for EMC pre-compliance testing. Professional staff can be on hand to assist with the test facility and equipment setup as required. Our shielded enclosures and specialised equipment are available for you to perform, EMC pre-compliance testing before your device is ready for formal testing, thereby minimising customer costs in cases where product emissions levels are likely to be above the limits. Besides our test chambers, we also have fantastic onsite facilities. If modifying your product is required to achieve compliance with the required product or generic standards. The facility has a dedicated electrical workbench. With an electronics magnification illuminated lamp. Various power and size soldering irons, electronic solder station for removing solder. Also some electrical and electronic components such as resistors, capacitors, chokes. Onsite electrical modifications generally can be undertaken on site either by yourself or by one of the team. The facility also has a dedicated mechanical workbench. Which includes a drill press, electric hand tools such as drills, sanders, jigsaw, grinders, polishing tools. With manual hand tools such as hammers, screwdrivers, pliers available. This mechanical bench is great for when enclosure modifications are required. Usually to achieve better shielding or improve bonding. In order to improve the shielding of you products enclosure or Faraday cage. Or to change cable assemblies and achieve better grounding etc. Our team are hands-on engineers. And should be able to help with how to modify your unit. Using the tools at hand along with years of experience in performing modifications to achieve compliance. We can provide formal NATA accredited EMC testing. EMC pre-compliance testing services for product development. Non-formal compliance testing or custom testing. Please see our pre-compliance EMC testing information. Or alternatively, contact us today to find out more about our EMC test facility hire options.